Thank you! The different skills people are bringing to this novel, above and beyond the work I did myself, is quite astonishing. Changes the way I look at the books I read. It’s true that you can stare a mistake in the face for ages and not see it if you’re so close to your text so getting copy edited must be a really helpful experience. What I think is most perplexing about the answers your copy editor gave is the number of errors that she found on the opposite end of the scale to yours. When I’ve heard agents and editors speak they always tell writers to only submit manuscripts that are as polished as possible. Perhaps that’s a relative term depending on the individual writer? I completely understand your point. Having reflected on it, I think what is expected of us is to do our best, and not present something sloppy, delivered in a rush. I suspect that for debut novelists this is particularly important; when you have a following you can probably pass on a little more ‘work needed’ in the name of meeting a deadline? Hmmmm, career changing information perhaps…! Can’t help but think you were cut out for it! I found being copy-edited a revelation. I used to think I could spell! And like you, I thought I had submitted a near-perfect manuscript. There’s no doubt that Barbara, my copy-editor, made my book a much, much better one. Three cheers for the copyeditors! Thanks for this – it is so interesting and useful! I’m currently polishing my first novel because I want to get it as good as I possibly can before sending it out. Your and Sarah-Jane’s comments reassure me that I’m right to pay this much attention to my writing but also that I’m not alone in always missing something. Sarah-Jane and other editors don’t have to fear about never having a job! Thank you! Good luck with your novel. My advice from all of this is really, get it so good that you’re proud of it in your heart, and that you know it inside out. You’ll still have plenty of work to do on it afterwards with all the lovely editors. I can’t see us ever doing them out of a job, I think they’re a different breed to us! Claire, you may never know how many copyeditors you have delighted with this post. This copyeditor thanks you! I want your copy editor. I guess I would have to be taken on by Bloomsbury. Wonderful post. Thank you. From what I understand there are some absolutely brilliant copyeditors, and there are others. I consider myself very fortunate! I really appreciate that you’re writing about the process after having a manuscript accepted. It’s such a mystery to those of us who dream of that day! Thank you. Really interesting – thanks for posting this. I love when an editor understand why I’m breaking the rules sometimes. It sounds like you were incredibly fortunate in your copy editor. I had one who inserted loads of Bridget Jones type exclamations into my heroine’s speech, altered the names of the French restaurants people were eating at, put in swear words and completely reversed the sense of a couple of passages by cutting out a couple of sentences as ‘unnecessary’. I changed it all back. The others were much better but it doesn’t sound as if they were anything like as helpful and thorough as yours was. Lucky you, it’s so encouraging when people really take trouble. I think I was. 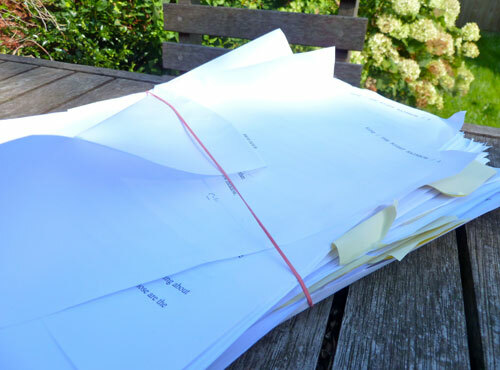 When I got the full copyedited manuscript back to double check, a coupe of weeks after we finished the queries, there were only two or three things that I wanted to ‘undo’. Oh and of course I spotted a couple of other things I wanted to change! Time to let go now, it’s gone to be made into bound proofs. This post resonates so much with the stage I’m at with my novel. Though I’m obviously light years behind you in terms of progress. I wish you the best of luck.